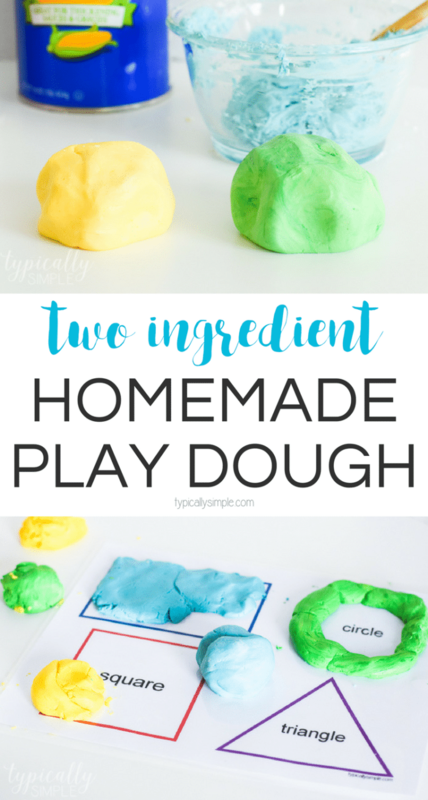 Just two basic ingredients are all you need to make this super soft homemade play dough! The kids will love how easy it is to mold, roll, and smush! Play dough is definitely one of those kids’ things that as a parent you either don’t mind or cannot stand and will not let into your house. I had some bitter feelings towards it when we had carpeting in our play room, but now that we have laminate floors and I can easily vacuum up all of those little pieces, it’s one of our favorite activities! 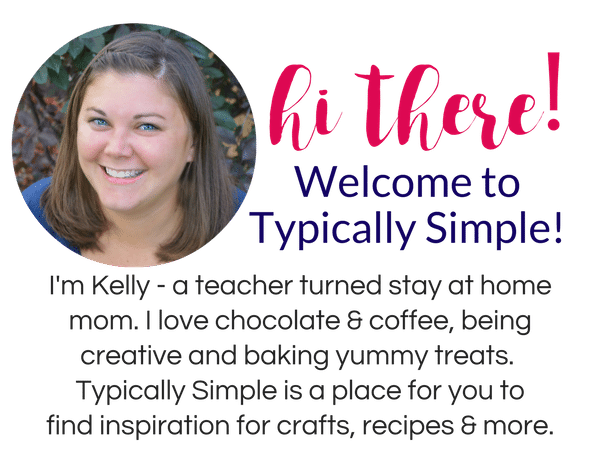 Even though the store-bought kind is definitely a staple in our house, it’s also fun (and educational) for the kiddos to help make some at home! They can help by measuring out the ingredient and mixing. It’s a kind of like a mini science experiment and art project all wrapped up into one! Plus there are tons of benefits to playing with play-dough including building up those fine motor skills and imaginative play. 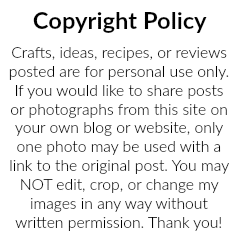 I shared a few more benefits to play dough, plus some fun activities and play dough mats over on the Typically Simple Facebook page. 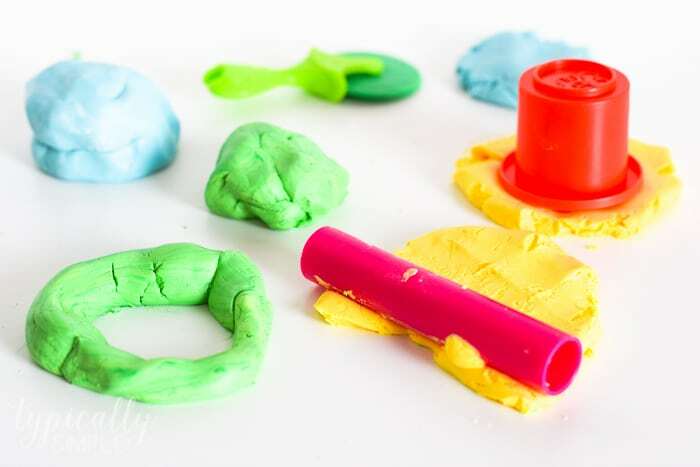 And because I’m all about sneaking in some fun learning activities for the kids, you can grab a copy of these printable play dough mats to use with your homemade play dough! I like to laminate the printable play dough mats so that we can use them multiple times, but you can also just print them out each time you want to use them with the kids! Or even slide them into a plastic sheet protector so they can be used again and again. 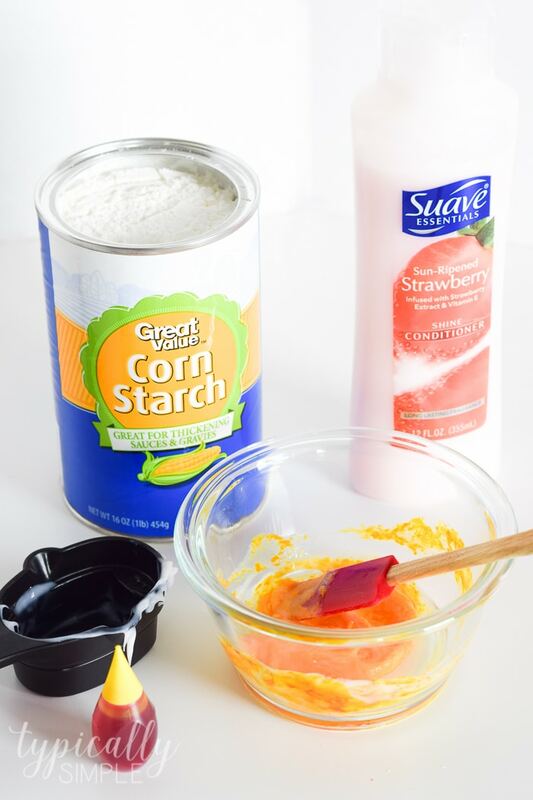 I usually use about 1/2 cup of cornstarch and 1/4 cup of condition and that gives us more than enough for one color. A trick for getting a rich color is to add the food coloring to the conditioner, mix well, then add in the cornstarch. If you find the play dough to be a little too sticky, add a tiny bit more cornstarch, or I have also found just a teaspoon or two of flour to really help! 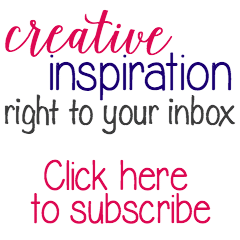 Looking for more fun kids’ crafts and activities?